South Korea's chief nuclear envoy said Friday that he focused on discussing ways to revitalize denuclearization talks with North Korea during visits to Russia and the headquarters of the European Union earlier this week. Lee Do-hoon, special representative for Korean Peninsula peace and security affairs, met with his Russian counterpart, Deputy Foreign Minister Igor Morgulov, in St. Petersburg on Tuesday. 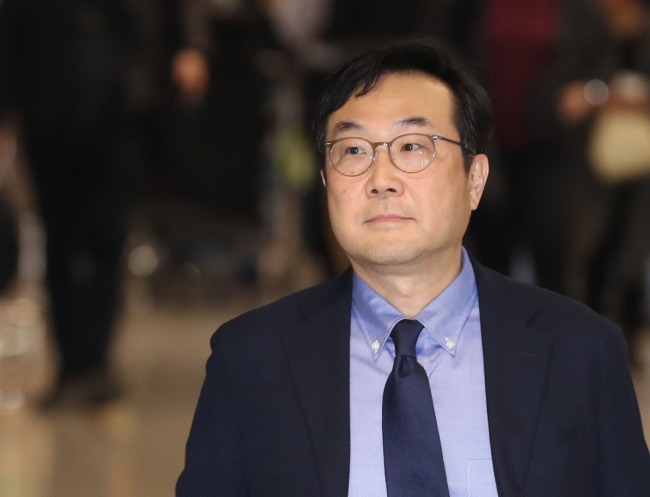 "Basically, (we) agreed that dialogue and negotiations between North Korea and the U.S. should be resumed at an early date," Lee told reporters as he arrived at Incheon International Airport. The two sides also agreed to work together in handling the situations at a "very sensitive and important time." Skepticism about the denuclearization and peace process on the Korean Peninsula has been rampant since the unfruitful Hanoi summit between Pyongyang and Washington in late February. Lee's latest overseas trip was part of Seoul's efforts to facilitate the resumption of dialogue in cooperation with the international community. Asked if there were consultations on strengthening sanctions on Pyongyang, Lee said, "I don't think it's time to talk about such an issue. For now, what's most important is to resume dialogue, rather than pressure." He was guarded about speculation that North Korean leader Kim Jong-un may soon travel to Russia. "I discussed various issues (with the Russian official) and agreed to continue communication with each other," he said. In Brussels, Lee attended a session of the European Union's Political and Security Committee and had talks with Helga Schmid, secretary general of the European External Action Service. Meanwhile, Kim Tae-jin, director-general for North American affairs at Seoul's foreign ministry, said that Seoul and Washington shared an understanding on the need for bilateral consultations at various levels, including those among top officials, for cooperation in persuading Pyongyang to return to dialogue. He made the remarks upon arriving from Washington. Asked about whether Washington complained about Seoul's push for inter-Korean cooperation projects despite a lack of progress in Pyongyang's denuclearization, Kim said, "Not at all." "As (the South and the U.S.) understand each other's position well, (the two sides) agreed to cooperate," he told reporters at Incheon International Airport upon arriving from Washington.